Today, it is difficult to understand that despite the tremendous Bach renaissance that took place in the 19th century, many compositions by the Cantor of St. Thomas’ Church in Leipzig had been underrated. The Cello Suites, for example, have been regarded for almost 300 years as purely a set of tricky etudes that every virtuoso in the making simply must tackle. Janos Starker’s recording of the Suites from 1965 makes a lasting impression on the listener, and even record producers who are well used to recorded excellence have been highly impressed. Starker’s full-bodied sound and technical brilliance are complemented by his finely chiseled interpretation that lends immense expression to Bach’s thrilling harmony and verve to the strict rhythmic construction of the movements. Just listen to his organ-like double-stopped passages, the eloquent dialogues, and the pure excitement he conjures up with his bow. Then you will surely agree with the often-quoted paradox that Bach's Cello Suites are "polyphony for a solo instrument." Customer Reviews (4.81 Stars) 26 person(s) rated this product. I have long been a fan of Janos Starker. Ever since I first bought the Kodaly cd. I've since reinvested in an analog setup and this box set has justified every penny spent. Incredible virtuosity brought to life through equally incredible sonics from 1965. A monument to the golden age of analog. My Koetsu Coral Platinum cartridge mounted on the Fisher Price Excaliber tonearm renders these grooves alive as the J.C. Verdier La Platine Magnum Turntable imparts its magic. The Realistic receivers phonostage and amplifier are beyond belief as they render electrons of Starkers genius to usable levels through my special hand crafted zip cord speaker cables suspended on Bellagio matchbook cable risers to my beloved Bose 901s. It is truly an experience not to be believed. Before this I have owned and loved the Yo Yo Ma Bach albums and love them, but this is a whole new playing field of extraordinary mastery... absolutely amazing. What to add? Not rushing through these pieces, perfect technical ability, emotion, balance, finesse, like Goldilocks porridge: just right! Recording wise, the rumble people mentioned does exist but it is not overbearing. Some systems will emphasize it more than others, I guess. On the other hand an up close and personal recording with tons of warmth, detail, texture and more than anything, presence! Almost feels like you are seating inside his cello. What else to ask for?!? Brilliant performance and quality recording. Cello solo at its best. Brilliantly played and the recording transports you to the performance hall. Must have for Classical music lovers. This is a fantastic box-set. The vinyl is dead quiet and the original recording, well that speaks for itself! ok,first off,this performance of the cello suites has been my favorite for years so when i found out it was on vinyl i jumped at the chance to get it,which i did,but i did think twice after reading the reviews.although the majority of the reviews were positive,the complaints about "excessive rumble"had me wondering about the pressings.i took the chance and i'm glad i did.the "rumble"that is present is present on the cd version as well.this is not a pressing issue or a remaster issue,it is simply the normal"rumble"present in any old restored tape recording.it simply was not altered compressed or EQed in any way as to preserve the nature of the performance.besides why cut yourself short and dismiss such a wonderful recording for something so insignificant.buy it and enjoy it. I'm very happy with this gift. The pressing is top notch. It might be too good as it reveals flaws in the original recording. I can recommend this set for folks who are just building a classical collection (myself included). These discs are getting a lot of play time. no CD can transmit such emotion. This is a must for any classical audiophile. I can't believe the quality of the recording. Truly outstanding and lives up to its reputation. 45 years after it first came out, this is still the gold standard for the Bach unaccompanied cello suites. Starker walks that fine line between mechanical exercise and overly romantic interpretation. He somehow manages a very disciplined presentation that is at the same time very musically engaging and anything but sterile. His tempos are spot-on, his tone beyond approach, his technique precise and liquid. The Mercury Living Presence stereo recording is a gift to mankind and the Speakers Corner re-issue captures everything that happened in the studio for these performances. A desert island record regardless of your musical tastes. 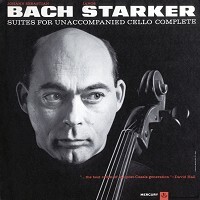 This is my very first Starker LP album: on the technical side, this is arguably the best cello album I have in my collection of LPs (and CDs); but it's the content that drove me nuts - I had to re-check my cartridge settings as there are cuts that are quite demanding that caught me by surprise the first time! An excellent album for collection. .e. I think Green Acres is right. There is a mechanical rumble on this recording, but the noise level is very, very low. Let's also just say that I hear Mr. Starker breathing and his fingers on the fingerboard and minor bow noise. I can even hear a harmonic note here and there as the bow is removed from the string. The G-string rings occasionally, but only where appropriate and it's damped at all the appropriate moments, so don't think there's this constant G pedaltone going on. As for the performance and recording. WOW! He's in my room, bringing along the slightly reverbrant studio ambience where the recording was made. The cello's sound is stunning, full of clear primary tones and rich overtones. The body of the cello resonates gloriously. I can't add anything about the performance. In all of music, it's one of the very most impressive I've every heard. Chilling and awesome. Buy it. It's worth every penny. and who could not, you will find this album rich. Forget it's vinyl and (at least on my setup) the cello could be there for real. Maybe not on every note, but often enough. The patterns of the music allure and the experience is just as tense as Starker's photo on the cover. Outstanding performance. Exellent recording and pressing. The very best of LPs. I have the CD version of the set. Well, the LPs are simply great. The sound is excellent, I can almost SEE Starker in my room when I close my eyes. A great job! The issue of rumble in these recordings. It appears that a number of people feel that there is rumble recorded in this wonderful set of records. There is no such thing, but that affirmation requires an explanation: In the First Cello Suite in G Major, the G string in the cello (second lowest) is often played "open", that is, no finger is placed on the string. In that condition, the string resonates and its sound lasts a long time. Particularly, it appears that the microphone technique in this record is such that you hear even the pushing of the left hand fingers agains the neck of the instrument. The microphone must have been indeed right by the cello. So, everytime Starker plays the open G string, quite frequently in the First Suite, it sounds like rumble to the musically less informed friends. What a rumble, though, a pure low G sound. Note that the string can vibrate even when higher notes are being played, and it happens in this recording. Hope that helps clarify the issue. I have had many versions of the 6 bach cello suites, and this is the best for many reasons...unbelievable heart, pure sound, just beautiful...I got the stereo version, and think I would like to hear the mono version next, but so much mula...the record sounds like a front row seat.. of course I can't vouch for your turntable diamond and system. A truly stunning performance. I own numerous versions of the cello suites. This is by far the most powerful. I have to agree with the previous reviewer about the persistent low frequency rumble--it nearly ruins this beautiful pressing. However, the cello performance is so stunning I still derive immense enjoyment from it. I can't imagine the reviewer who states the is "no rumble" in all caps! I won't list my equipment either, but it is obvious. I do listen to such music at relatively high volumes, though, so maybe that is why some of us hear it and others don't. In the end, I highly recommend it (4 stars) for its performance, but am disappointed by the rumble noise. One of the finest reissues EVER!!! I'm very impressed with the equipment the previous "reviewer" has. However, I'm comfortable enough to write about this recording without listing everything I own. What I will say is that I have originals of these records in both mono and stereo (gold label promo). This set is SO DAMN GOOD, I sold my original stereo copies. There is absolutely NO RUMBLE on these issues. This is a stunning example of reissued material that exceeds the original recordings in harmonic color, tonal balance and musical texture. Anyone who has the slightest interest in owning the finest sounding performance of Starker's masterpiece, must own this set. This is a bargain and must be in every classical musical collector's collection. It also happens to contain "you are there" audiophile sound of the highest caliber. I'll be brief. This set proved to be the ultimate destination recording for a definitive work of moving cello virtuosi. It has so much going for it but in the final analysis, played back on a Walker Proscenium/Clearaudio Insider Ref wood body/Atmasphere MP1/M-60/Avantgarde Duo setup, it proved unlistenable due to an all pervasive low frequency rumble that simply proved to be intolerable. I sold my copy to former Acoustic Sounds equipment guru Richard Duplantis, whose Cremonas do not plumb the depths to the degree my setup does.